I have had cystic fibrosis my entire life. In spite of the doctors’ initial claim that I would not live past the age of 2, I am now approaching 22 and getting stronger every day. I am a big believer that exercise keeps me healthy and have been running since the 7th grade. 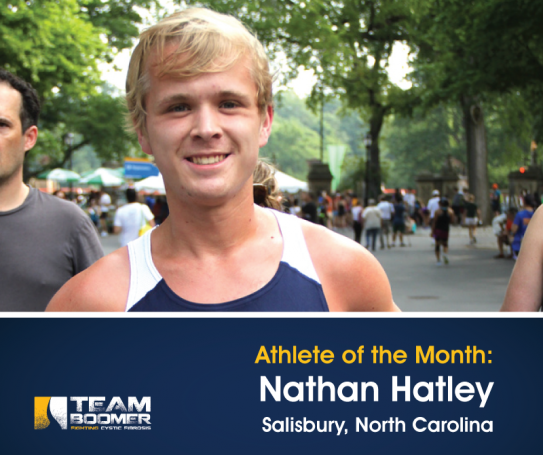 I got really serious about running once I started cross-country in high school, which led to my running for Catawba College in Salisbury, NC. After I graduate, I want to become a Cross Country/Track and Field coach so that I can help inspire people to run. I was introduced to the Boomer Esiason Foundation and to Team Boomer when I applied for and was given the Exercise for Life scholarship. My parents had been looking online and found the EFL scholarship – one that required a student to have CF and to regularly exercise, so it was perfect for me. Receiving that scholarship enabled me to attend UNC at Greensboro for a year and it opened my eyes to BEF and all of the amazing things they do. The Exercise for Life scholarship put me on track for my college education and encouraged me to keep working hard athletically and academically, to remain compliant, and to continue to be a good example for other CF patients my age. My favorite Team Boomer memory is from my first time running Boomer’s 10k Run to Breathe. I was very excited to finally participate in something for the foundation. I remember how awesome it was to come through the finish as not only the first Team Boomer runner, but as a patient with CF. People often think that someone who has as many chronic difficulties as I do isn’t able to do much, especially athletically. So I take pride in showing people that my disease doesn’t make me weak, it makes me strong. Participating in that race and meeting up with Jerry Cahill and even meeting Big Boomer himself showed me that there are people out there who are passionate about finding a cure for this disease and giving aid to those who live with it. In the beginning, I ran because I wanted to be competitive and because it was good for my health. As I gained success with my running it became a window of opportunity for me. It became my way of leaving my name behind at my high school on the record list, and it became my ticket to college. Throughout those years running has become my way of life, it keeps me healthy and fit, and it constantly provides me with a challenge to better myself. But most importantly, I run because I enjoy it.